Though I wouldn’t consider myself a full-fledged believer of past lives or reincarnation, I haven’t written off the concept either. 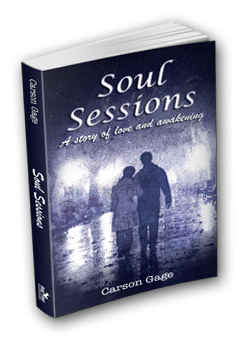 But I had no idea when I accepted the opportunity to review a book titled Soul Sessions by Carson Gage that I’d be reading a story about one man’s past life regression therapy experiences. Whoa. The man I’m talking about is Nick Dalton. He’s a stereotypical successful and well-off man who is unfulfilled despite his material wealth. From the very beginning of the book, it was obvious that Nick is completely out of touch with who he truly is and what he values, and operates from his ego- chasing things that don’t make him feel whole; like fast women and big money. Before Nick has a chance to kill himself, he sees a therapist that challenges his belief system and asks if she can try hypnosis on him in an effort to reveal the cause of his core issues. This is where the past life regression begins for Nick and reveals a multitude of past lives, including one past life as a slave. This book did what I like books to do: it made me think. You see, the entire purpose of Nick engaging in hypnosis was to uncover any memories that would help him in his present life (which was going to crap). Throughout the hypnosis I wondered: what circumstances are in my current life that I can learn from? And if life is merely (lol) a series of opportunities to learn and grow, what do these challenges that I have mean? These are big time questions from a book that took only hours to read. The idea of dying and coming back as someone else has always scared me. You see, I feel very comfortable with my life and worry that I’ll reincarnate into some pretty messed up circumstance. But this book put that fear to bed when one of Nick’s hypnosis sessions led him to realize that souls, “…often choose difficult lives for the purpose of gaining an experience…” to learn and grow. This notion of “choosing” the life we have never occurred to me and was definitely my favorite Nick moment. And though Soul Sessions is fiction, the quest for inner knowing is all too real.